At any time, Trent Klingerman might receive a call or an email that requires him to change his plans for the entire day. It's precisely that element of unpredictability and challenge that Klingerman loves about his job. As director of employee relations in Human Resources, Klingerman advises employees and managers about employment law and University policies, manages a team of conflict resolution specialists and helps areas on campus improve their interpersonal dynamics. It's a job that keeps him busy -- and one he finds deeply satisfying. As Employee Relations' director, I oversee our seven employee relations specialists. This team helps Purdue employees understand their rights during interpersonal, work-related disputes. It also helps employees and managers resolve these problems early and amicably, before they become formal grievances. To best serve our employees, each employee relations specialist is assigned to specific areas on campus. Upon request, Employee Relations also visits units on campus to do organizational assessments. These assessments help units learn how employees might work better together, and therefore how they might be happier and more efficient in their jobs. For example, as part of the assessments, we often use the Myers-Briggs Type Indicator to help employees and their co-workers identify their personality types. The idea is to help everyone understand how to work together better. What are some of Employee Relations' other duties? Along with Human Resources’ Talent Acquisition Team, Employee Relations conducts training for new supervisors once per month. This training covers how to hire employees legally and within University policy, and it teaches managers how to interact with their employees. Every Monday, Employee Relations also facilitates an orientation program for new Purdue employees. This program includes opening remarks from the University’s senior leaders, and it covers everything employees need to learn about working at Purdue, from benefits to public safety. It is truly a remarkable example of several areas coming together to showcase the best the University has to offer. What other duties do you have? I work often with Steve Schultz, the University’s legal counsel, on matters involving Human Resources and academic affairs. 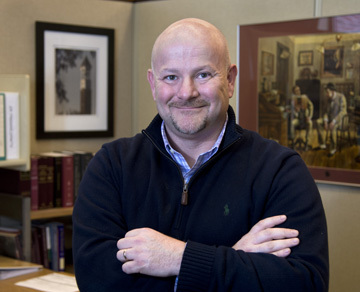 Steve is the University’s first full-time, in-house legal counsel, and he’s focused on establishing an operation that provides professional, responsive legal services internally, saving the University fees it would otherwise pay to outside counsel. Many questions that come to his attention involve faculty and staff issues, and I’m able to act as a liaison between his office and Human Resources and assist him in responding to the issues. While it does add to the complexity of my work, it’s a terrific opportunity for me to use my legal training and background to bring positive value to the University. What's a particularly challenging aspect about your job? I deal with a huge range of responsibilities and tasks -- employee conflict resolution alone can be an enormous endeavor simply because our University is so big. Conflicts are always very specific and often deal with sets of circumstances unique to the parties' area or unit. Honestly, though, I love the complexity involved in my job. I love how no two days are ever the same, and I like helping Purdue's employees through tough, personal issues -- and employment-related issues are always very personal. I began working in my role here at Purdue in November 2012. Prior to that, I spent 12 years as an employment lawyer at a local law firm. When this position opened up, it required a law degree, and with my background it felt like a natural fit. Plus, I had a lot of friends and professional contacts at Purdue. I also earned my bachelor's degree from Purdue, and I've always been interested in higher education. It was the perfect opportunity. My job is incredibly enjoyable because it lets me draw upon my legal training and my interest in higher education. I really enjoy working with my colleagues and with Purdue's employees. Things can get hectic, but I wouldn't have it any other way.